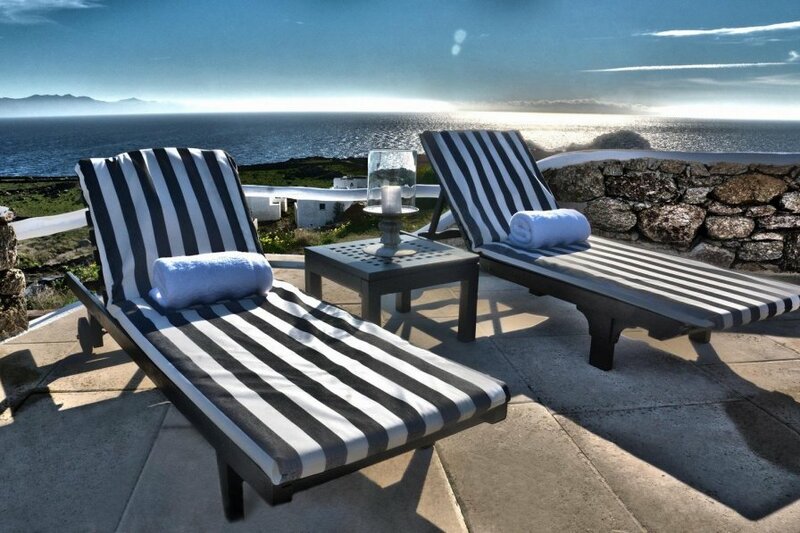 This 12 bedroom villa with private pool is located in Mykonos and sleeps 26 people. It has WiFi, barbeque facilities and parking nearby. Villa Carina is a luxurious villa located between the famous Paradise Bay and the hip Super Paradise beach, near the well known beach restaurants Jackie'O and Cavo Padiso. Ideal for travelers who love uninterrupted sea views, this 250 square meters luxury villa consists of six spacious and carefully decorated bedrooms, each with its own en suite bathroom with shower while the master one comes with a Jacuzzi. In this stunning villa on Mykonos you can find an open kitchen, large indoor dining and living rooms, an immerse outdoor dining area, bar and BBQ, all covered by pergola. There is also a 110 square meters swimming pool, a comfortable outdoor living room-lounge, area covered by a pergola, surround sound system all around and a WC. The villa consists of a Main house with six bedrooms and two guest houses that can accommodate two couples. The ground floor of villa Carina consists of an open kitchen with large indoor dining and living room with a TV & A /C system. Guests have front and side access through balcony doors to the outdoor dining, bar and BBQ area, covered by a pergola. Outdoors, guests can also relax at the beautiful, pergola covered lounge-living room area next to the swimming pool, while enjoying the surround sound system which is installed. Amazing sea and pool view. -1 Bedroom with 2 single beds, A/C system, en-suite bathroom with shower, access through balcony door to the outdoor dining area. -1 Bedroom with a double bed, A/C system, en-suite bathroom with shower, big window and access through balcony door to the outdoor sitting area. -1 Master Bedroom with a double bed, A/C system, en-suite bathroom with shower and Jacuzzi, access through balcony door to the front terrace where guests can relax at the outdoor pergola covered sitting area while enjoying the beautiful sea view. -1 Bedroom with a double bed, A/C system, en-suite bathroom with shower, big window with an amazing sea view. -1 Bedroom with a double bed, A/C system, en-suite bathroom with shower. Guests have access to the side terrace through balcony door and they can relax to the outdoor sitting area which is covered by a pergola and enjoy the sea view. -Guest house with a bedroom with a double bed and 2 single beds (partitioned). The apartment also has an A/C system, bathroom with shower, 2 armchairs, coffee table & mini refrigerator. -Guest house with one bedroom with double bed, a fully equipped kitchen, A/C system, bathroom with shower & sitting area with a big window and beautiful sea view. -1 Guestroom with one bedroom with a double bed, kitchenette, A/C system, bathroom with shower & big window with sea view. -1 Guestroom with one bedroom with a double bed, A/C system, mini refrigerator, bathroom with shower & big window with sea view. -1 Guestroom with one bedroom with a double bed, A/C system, bathroom with shower & big window with sea view. -1 Guestroom with one bedroom with a double bed, a fully equipped kitchen, A/C system, bathroom with shower & big window with sea view.